Perhaps the hardest habit to break is attempting to describe a bird based on colors, at least initially. We’re all guilty of this. 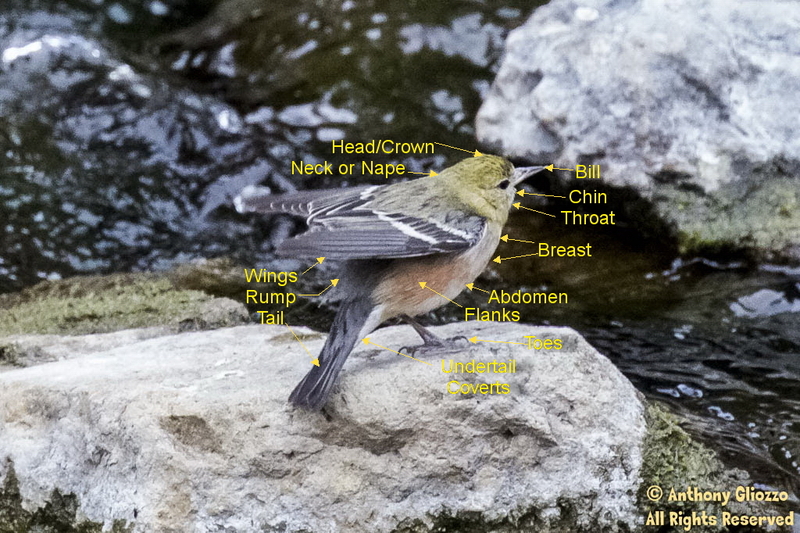 Novice / beginner birders write and state inquiries such as the bird had a lot of yellow on its wings. Wow that’s a tough starting point! Breaking this habit may not be easy but persistence in listening to bird calls, observing behavior, noting size and shape, location and date will all help you in becoming a better birder. Where was the bird seen with respect to geographic area? At the coast, desert, on a lake, suburban area, in a canyon, mountainous walk trail, a marsh, etc. What was the size of the bird? Was the bird high up in a tree (5 feet, 10 feet or 80 feet up)? Was he or she singing on the ground and digging in the dirt? the Head – think of human head – birds can have a mustache, eye brow as some basic examples. the Bill – was it small and shaped like a cone or long and possibly curved upward or downward? the Song or Call – was it loud and melodic, harsh or a high pitch chirp. All birds have unique Songs though some have calls that can overlap such as the Song Sparrow and Lincoln Sparrow. A song or a call can help identify the species almost immediately. Most Smart Phones have a Voice Recorder. Use this option whenever possibly and record what you are hearing. It could eliminate the need for all steps in your identification process. Learning and memorizing songs calls on the other hand comes with constant repetition of seeing and hearing the bird. I’ve gotten to a point where I can walk for an hour, not see a single bird and hear calls only. Yet, without vision, I can typically accurately ID the bird if on a local walk or at least narrow it down to a species such as Sparrow, Warbler, Raptor, etc. Also, 3 specific ID Points are always best (or more) to make a proper ID. And finally, the colors or as some would say “plumage”. However breaking down the sections of the bird with a color description is best such as “I saw a medium sized raptor like bird, that had grayish topside wings, all white throat and belly with yellow claws”. A mouthful of info but the more the merrier as they say as this might lead me to think it could be a White-tailed Kite. Here’s a basic example using this Bay-breasted Warbler as my subject indicating basic sections of this Passerine (songbird). This is not a common bird by the way but this photo was used due to its tail being pitched downward and wings upward allowing for better illustration. The sections illustrated for this Passerine are not intended to be complete but merely basic in form.